[UPDATE Dec 17: Election Results] Rolfe Commissiong [PLP] has defeated Jeff Baron [OBA] and Independents Tillman Darrell and Leyoni Junos in C#21 Pembroke South East. This will be Mr Commissiong’s first time in the House of Assembly. 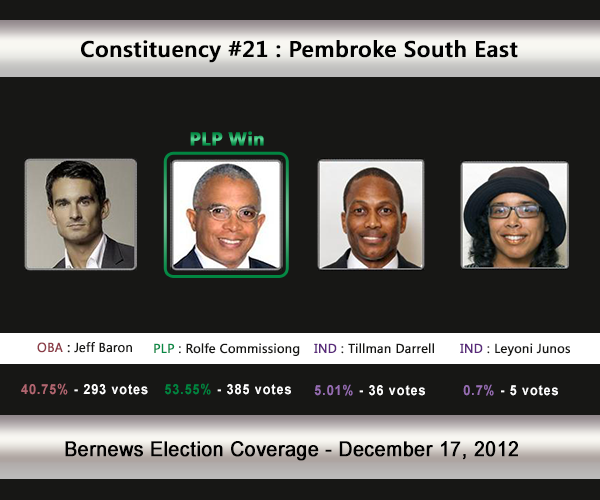 Traditionally seen as a PLP stronghold, the voters of Pembroke South East will be selecting between the OBA’s Jeff Baron, the PLP’s Rolfe Commissiong, and Independent candidate Tillman Darrell. The incumbent is the PLP’s Ashfield Devent who won 67.61% of the vote vs the UBP’s Tillman Darrell [526-252] in the General Election 2007. In the 2003 General Election, Mr Devent won with 70.82% of the vote against Rocky Fox [UBP] who received 29.18%. 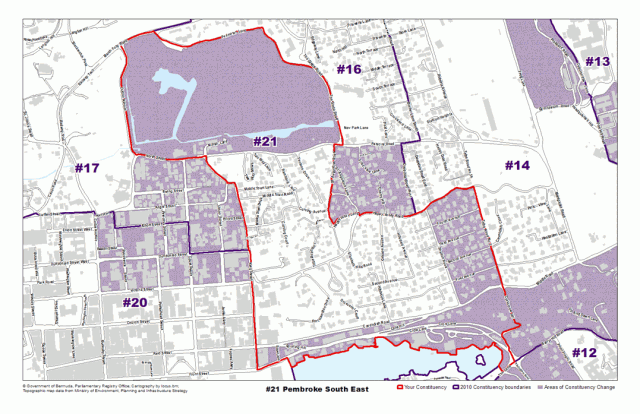 Areas the Pembroke South East constituency compromise, or is located by, include North Street, Angle Street, Court Street, Parsons Road, St. Augustine Road, Curving Avenue, Happy Valley Lane, Shelton Road, Cavendish Road, Reid Street, and King Street. Rolfe Commissiong is a tireless advocate on behalf of working people in Bermuda and a strong proponent of economic empowerment initiatives directed toward those who have been historically disadvantaged. Mr. Commissiong was educated at Mount Saint Agnes Academy, Warwick Secondary School and at Baruch College of the City University of NY. He formerly served as the Consultant to two of Bermuda’s Premiers. His most recent work was focused on implementing the recommendations found in the final report on young Black males, which emerged out of the study conducted by Professor Ronald Mincy of Columbia University on behalf of the Government. More recently, under the direction of former Minister of Community Development, Minister Michael Weeks, he has been instrumental in the re-establishment of the Bermuda Youth Council and in the adoption of the “Job Corps” programme which is a Mincy recommendation. The “Job Corps” programme along with “Career Academies”, another Mincy recommendation will create a “Bermuda Technical Institute” for the 21st Century. Both of these programmes will greatly enhance our workforce and youth development systems. The Job Corps programme is designed to assist young Bermudians by giving them, a second chance in obtaining those technical and vocational skills they will need in order to compete in our increasingly complex and competitive economy. Mr. Commissiong also headed up the Government’s Waiver Assistance Programme that assisted those affected Bermudians, in obtaining visas to travel to the United States. In 1998, Mr. Commissiong founded a multifaceted communications company called Black Star Communications Ltd. The firm provides consultancy services in the areas of public relations and communications. Under the Black Star Communications banner, he created and implemented the “CUP Match Classic Safe Hands Award”, which goes to the player selected as the best fielder in Cup Match and which is now in its 14th year. He has served on a number of Government Boards, including Planning, The Broadcasting Commission and Chaired the Club’s Committee in 2006, which examined the state of Bermuda’s “Workingman’s Clubs”. In 2005, he served on the Bermuda Independence Commission. In addition, he has produced documentary and public affairs programming for television, such as “The Big Conversation”, which he hosted and which formerly aired on CITV. A member of Pembroke Hamilton Club, Mr. Commissiong is married to Roxanne and has two children. Jeffrey Baron is the National Security Spokesperson for the One Bermuda Alliance and is the OBA’s election candidate to represent Pembroke South East in the House of Parliament. Jeff is a Bermuda-born specialist in crime prevention with more than a decade of experience and a Masters Degree in Criminology. Jeff spent his early childhood on Happy Valley Road in a house that his great grandfather built. His upbringing is what inspired him to a life of service. Jeff has served as a Sergeant in the Bermuda Police Service, directed all security operations for Rosewood Tucker’s Point and led a tactical response team on a multiyear United Nations peacekeeping mission in Kosovo. He is the first and only Bermudian to be deployed as a Field Officer for the UN Department of Peacekeeping Operations. In January 2011, after earning his Masters degree in Criminology, Jeff presented a strategic crime reduction paper to the Horton Committee ‘Joint Parliamentary Select Committee’ on gang violence. Jeff’s valuable contributions on this nationally important issue have made him a trusted and authoritative voice on National Security policies in Bermuda. Jeff recently graduated from the ‘Senior Executives in National Security’ program held at Harvard University’s John F. Kennedy School of Government and is currently working on a strategic adaptation of Bermuda’s National Security priorities for the One Bermuda Alliance. Jeff is married and has a three year old son. Tillman Darrell was raised in Middletown , deep in the heart of Pembroke. He lives in Devonshire now, but this is his home: He grew up here, it’s where his family and friends live and it’s where he’s going to run in the next general election. The 46 year-old believes the black working class constituency needs a new voice. He says the people around here have been “forgotten.” On the one hand they work hard, contributing to the economy. On the other, a lot know they’re never going to have enough cash to send their kids to college or break the cycle of living from pay cheque to pay cheque. “The kids realize they’re not going to go to college from the time they are born so the drive and motivation to do well in school isn’t there. All they want to do is get out of school, earn some money and help mom,” he said. “Growing up over the decades there’s been no real changes with either the United Bermuda Party or the Progressive Labour Party. If anything there’s more frustration, desperation and anguish, with younger people in particular. And they are much more vocal about it,” he said. The people around here don’t want miracles, just the basics. “They want food to be cheaper; they want to know their kids can succeed like other kids,” Mr. Darrell said. Mr. Darrell talks about establishing a national register of single parents and giving them registration cards to get discounted groceries, school uniforms and cheap travel. It’s not welfare, he insists, saying these are people who are working but still can’t make ends meet. Currently Self Employed Consultant at BarNone Telephony Network Solutions Ltd.